Mr. Woodward was a fan favorite at the event. I watched him as he was so gracious and greeted everyone with kindness and a smile. During the panel, he was asked about his unique method of never blinking during a scene. His response, “Most of the time, I was a bad guy, and I never wanted to blink, because if you blink, you’ve lost the battle. If I liked the leading man, I would sometimes blink. But if I didn’t, I never blinked.” A female in the audience asked, “What about a leading lady?” His response, “Oh, I made passes.” (Roar of laughter from the audience). 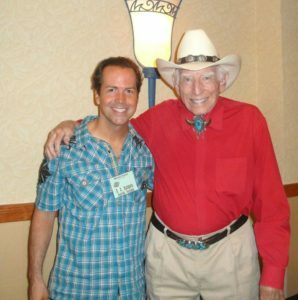 Mr. Woodward’s still going strong at 91! B.B. to Perform Valentine’s Day Evening at Fultondale FBC! Copyright © 2016. B.B. Hudspeth. All Rights Reserved.